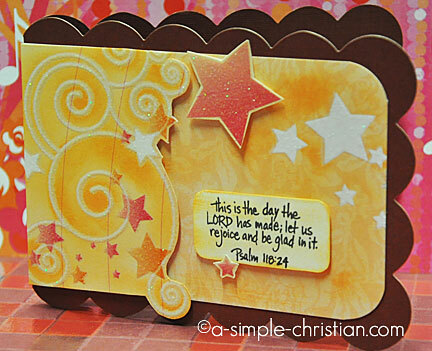 Extra-special happy birthday cards with prayerfully chosen scripture verses as part of the card design make Christian birthday greetings meaningful and to be treasured. 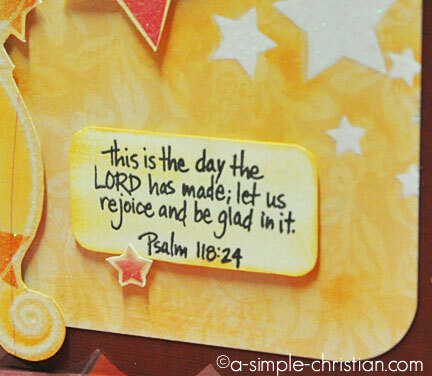 Below are two Christian greeting cards made by hand with printed paper and die-cuts. The card pictured above is more appropriate for a young woman but might also be suitable for older women because of the card design and color combo. Orange color textured cardstock 4.5" x 12"
Scrapbooking paper: The Music Stack by DCWV 3.5" x 5.5"
QuicKutz Die: Scallop Circle 3"
Die cut orange color textured card with Sizzix's scallop card die. Score scallop card and fold at center. Round right corners of scrapbooking paper. Adhere to front of scallop card with double-sided tape. Punch out the trellis, trim to 3.5" length and stick onto the left side of scrapbooking paper with glue. Die cut scallop circle with white cardstock. Die cut vellum with Spellbinder die and emboss. Ink scripture verse stamp with Memento ink and stamp image on white cardstock. Punch out verse with 2" circle punch. Apply glue to back of punch out verse and adhere to center of vellum die cut. Use strips of double-sided foam tape on back of white scallop circle and vellum die cut. Assemble by attaching vellum to white scallop circle and then onto the front of the scallop card. Refer to picture above for placement. Here's one that has the same scripture verse but having a more modern design with swirls and stars. Great for young girls or boys. The print paper is from the The Music Stack by DCWV (Provo). What I did is rubber some orange color ink onto certain part of the swirls to bring out the design and trimming and cutting out the stars and using double-sided foam tape to lift up the elements thus giving the card a 3D effect. Don't have Scripture verse on a rubber stamp? 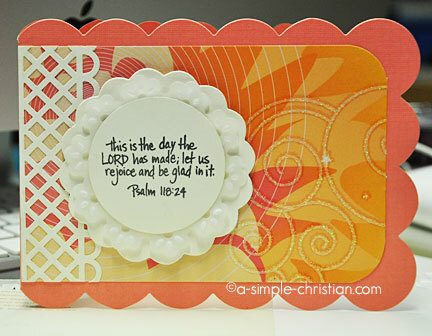 You can easily create the bible verse on a Word document and print out onto white cardstock. For a whole list of Card making Tips, check out this page. Let me know what you think about what you just read. Leave me a comment in the box below. My name is Flora Tan. I’m a crafter, web publisher and above all, a simple Christian practicing letting go and embracing God moment by moment. Motto in life: None but Christ! Daily Declaration: I am the Righteousness of God in Christ. Sign up and be encouraged. 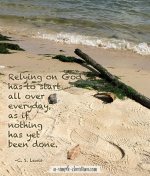 Christian quotes for christian sermons and christian greeting cards. Inspirational quotations to inspire us to higher living. 20 Christian Quotes About Life - Powerful Words! 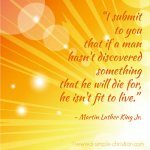 Relevant Christian quotes about life for living victoriously in Christ in the midst of a troubled and uncertain world. 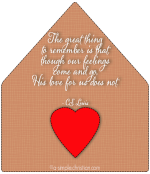 25 C S Lewis quotes which I not only enjoy but also find truth in the reading. They are mostly from the book Mere Christianity. © 2019 Flora Tan www.a-simple-christian.com All rights reserved.